The newest listings on the market aren't always new, and our new database allows us to see the flow of inventory like we've never seen it before. You see, Realtors are always trying to game the system, either to gain an advantage for their home seller or through ignorance of how the internet has changed the way we market a home for sale. Either way, when you see a house that shows it has only been on the market 3 days, just know that it very well might not be true. 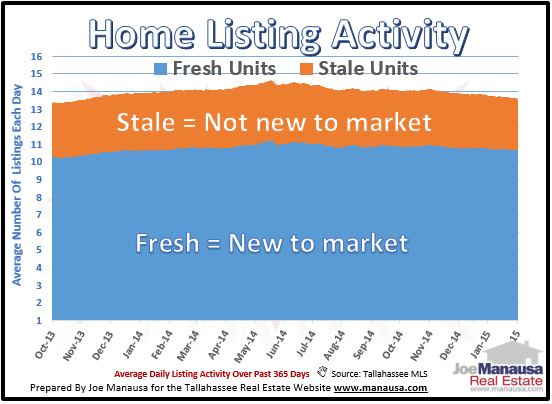 So take a look as we unravel the data to show you just how fresh the newest listings are in the Tallahassee MLS. How Long Has This Home Been On The Market? One question we get from buyers all the time relates to how long the seller has been trying to sell the home. Realtors often attempt to hide this fact by cancelling a listing and then entering into the MLS again. This re-starts the clock and makes the home appear to be fresh to the market, when in reality it might have been marketed for many months or even years. 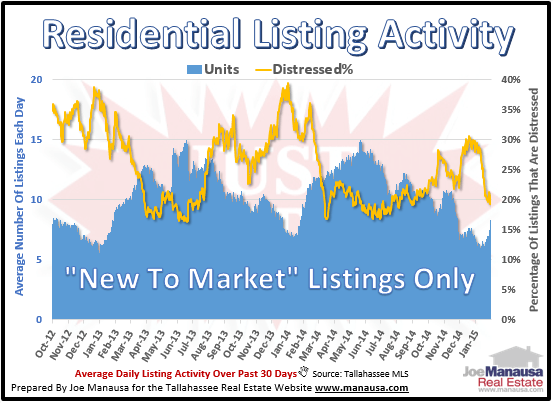 The real estate graph above shows that over the past year, a little more than 13 homes were listed each day, but 3 of these were not fresh (they were just being "relisted"). So basically, ten fresh listings are hitting the market each day, on average. Due to the fact that homes are re-listed on a regular basis, we can't pull these reports from the MLS system directly, we have to separate the fresh new listings from the stale ones being re-listed all the time. Do you see the trend below? The graph above shows the thirty day trend of fresh new listings coming onto the market each day. Every year, right about NOW (early February), the trend starts to rise and usually peaks in June. The gold line in the graph above shows that roughly 20% of the fresh new listings (one in every five) is being sold as a distressed sale (short sale, foreclosure, or bank owned property). I hope today's article helped you understand that all is not as it seems when it comes to buying or selling a home. Don't be tricked into selling too low or paying too much. Work with a real estate company that understands the games within the game so that you have the most current information and are positioned to negotiate the best deal that can be found.